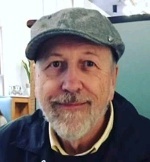 Posted on April 14, 2019 by Robert Tuomi wrote in Entertainment News. It has 0 Comment. Moriarty’s Friends, set mostly in a therapist’s office, is Theatre in the Gallery’s last installment in the Monkeys With A Typewriter Theatre Company’s series of actors largely playing themselves. In this case, Kevin Doak, one of the founders of the Company, brings to life a most fascinatingly complex story largely describing the antics of his formative years. 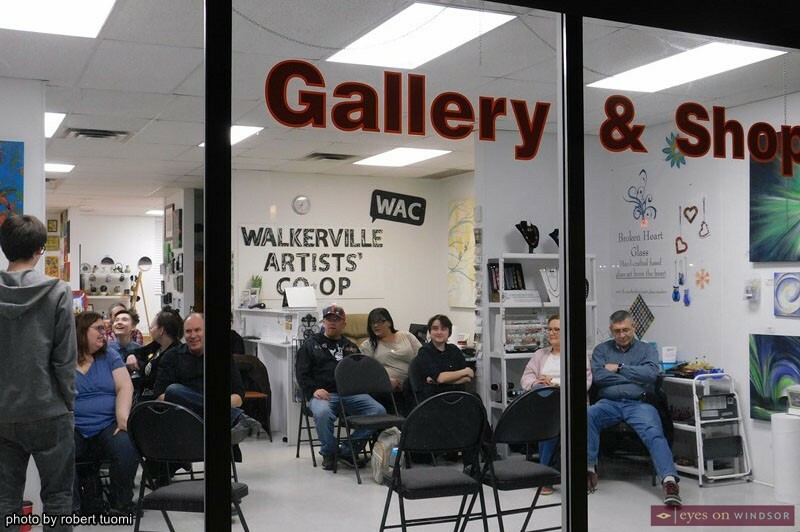 It was played out for the last time Saturday night in the Walkerville Artists’ Co-op in Walkerville. To say the least, young Doak let no moss grow wherever he was. With a little persuasion he was able to move the immovable, even bullies, a scene in which special effects are used to lift fellow Company founder Rob Tymec, playing a bully, right off the ground. 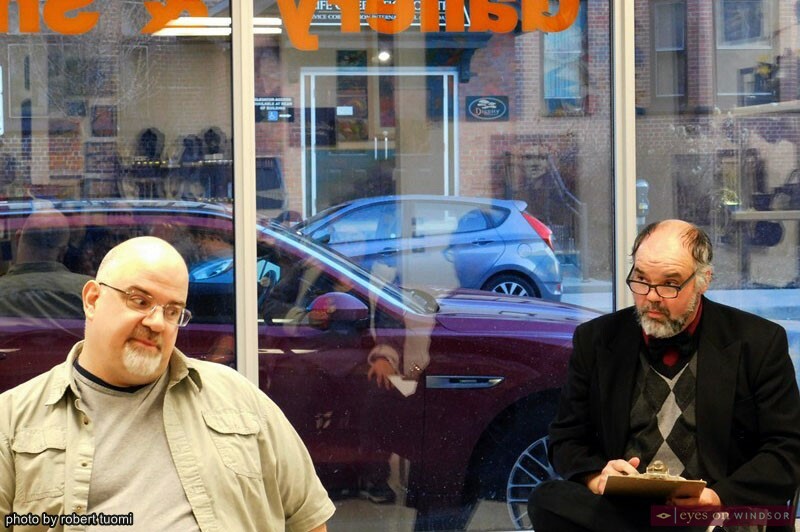 Actors Kevin Doak (left), and Rob Tymec performing in Theatre in the Gallery’s Moriarty’s Friends, part of the “Actors Playing Themselves” series, presented by Monkeys With A Typewriter at the Walkerville Artists’ Co-op in Windsor, Ontario, on April 13, 2019. Photo by Robert Tuomi / Eyes On Windsor. Most often Doak’s exploits, which he recounts to his court-appointed therapist, are down right criminal. But they are plausible enough to be from his past considering he came by these brushes with the law honestly enough. Most of his friends, he admits, are or have been behind bars. Somehow, he manages to stay on the outside of the local jail until he meets a certain immovable object, his work supervisor Leo. A disagreement develops which he reckons can be solved right there and then with fisticuffs. Although the audience doesn’t see the altercation, he does describe it all to Tymec who, with perfect consternation and erudite passion, plays the role of the therapist charged with determining if Doak needs a little anger management training. Possibly clever writing, Doak stays the same character throughout. Tymec, and the third member of the cast the always enjoyable and highly flexible Eric Branget, on the other hand, bring to life the many different characters from Doak’s long gone years. At one point, to illustrate Doak’s role as a wing man, Tymec departs only to return as a red-haired bombshell. His entrance from the back of the gallery is so spectacular… only until he turns around does the audience realize there are no more actors. 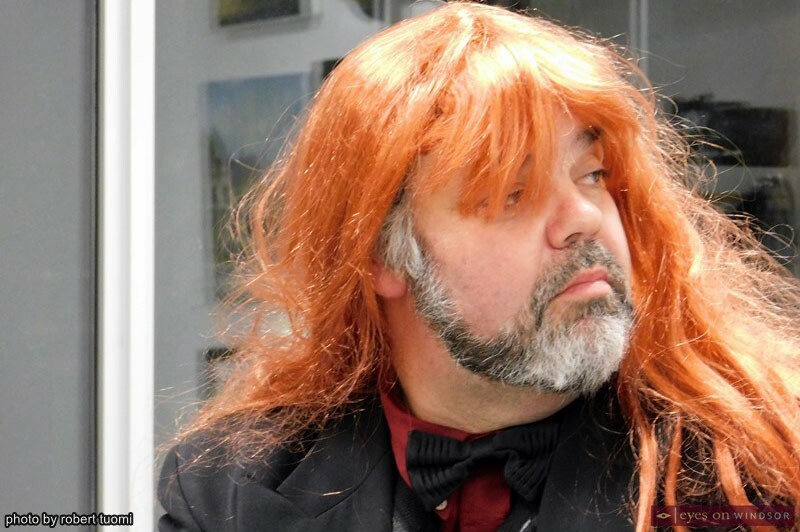 Roy Tymec performing the role of a very attractive woman in Theatre in the Gallery’s Moriarty’s Friends, part of the “Actors Playing Themselves” series, presented by Monkeys With A Typewriter at the Walkerville Artists’ Co-op in Windsor, Ontario, on April 13, 2019. Photo by Robert Tuomi / Eyes On Windsor. The script is nothing short of brilliant with Doak proving himself adept at subtle, all-natural knee-slapping humour. This keeps the audience amused and detracts them from contemplating the authenticity of the events being presented. It could well be that, seen as how, Doak never did time for his multiple crimes, he might have embellished things a little. A lot. Or not. A clue is his overreaching goal of being the new Moriarty, the criminal behind the crimes investigated by Sherlock Holmes. He was, in Doak’s mind, the much more fascinating character. 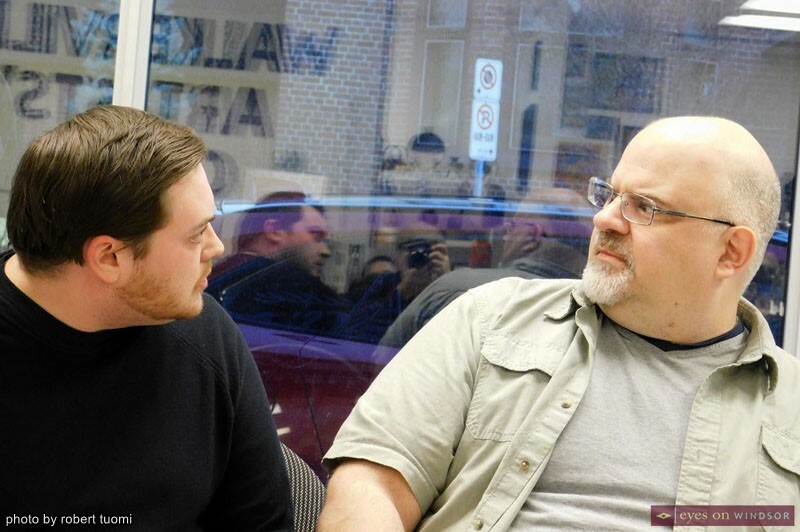 Actors Eric Branget (left) and Kevin Doak performing in Theatre in the Gallery’s Moriarty’s Friends, part of the “Actors Playing Themselves” series, presented by Monkeys With A Typewriter at the Walkerville Artists’ Co-op in Windsor, Ontario, on April 13, 2019. Photo by Robert Tuomi / Eyes On Windsor. 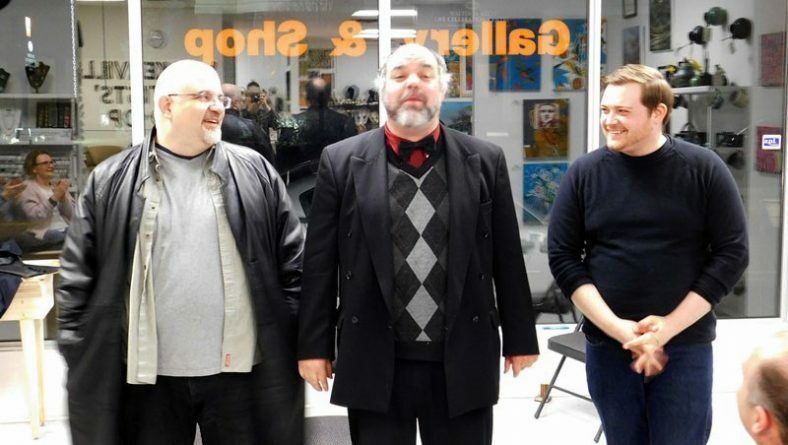 Putting a play on in an art gallery, Tymec tells Eyes on Windsor, is more of a trend lately. It has some advantages. One, it is performed in a most unusual location. Quite out of the ordinary enough to earn considerable enthusiasm from the Co-op, enough for Tymec’s Company to run three to four plays there annually. It also removes most of the traditional barriers between the actors and the audience. Because the floor is flat, no higher stage area, the audience is drawn into the play in a manner not practical in a standard theatre. For Eric Branget performing in a non-traditional venue, without the usual structure of a stage, is not as demanding as it is different. In a theatre, actors only worry about the so-called fourth wall, the audience. In the Gallery, the challenge is to work within all four walls and do it in a fully believable manner. Of course, Branget accomplishes this readily by relying on his depth of talent. 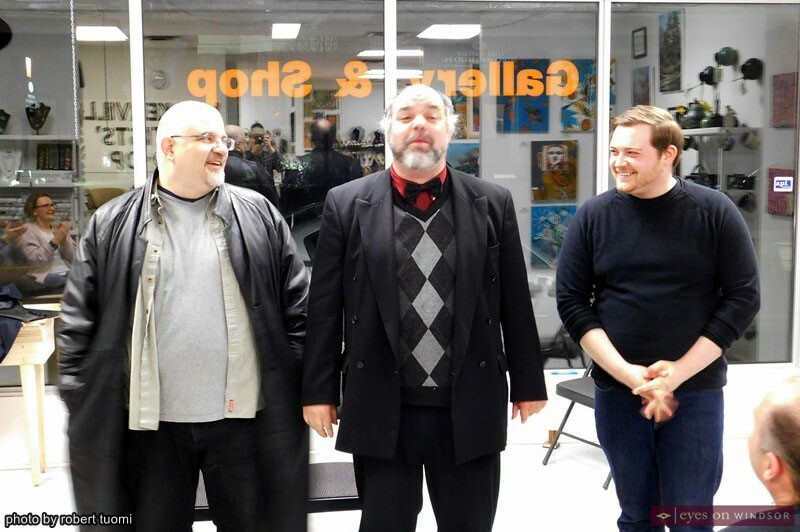 Audience members enjoying Theatre in the Gallery’s Moriarty’s Friends, part of the “Actors Playing Themselves” series, presented by Monkeys With A Typewriter at the Walkerville Artists’ Co-op in Windsor, Ontario, on April 13, 2019. Photo by Robert Tuomi / Eyes On Windsor.